Theresa May earlier asked for a short extension of Article 50 until 30 June. BRITISH PRIME MINISTER Theresa May has said it is a “matter of great personal regret” that the UK will not leave the EU on time with a deal, with a deal and that it is “high time” for MPs to make a decision. May was speaking at Downing Street this evening after earlier writing to European Council President Donald Tusk seeking a brief delay to Brexit, telling the House of Commons she had asked him for an extension until 30 June. “Two years on, MPs have been unable to agree on a way to implement the UK’s withdrawal. As a result, we will not leave on time with a deal on 29 March. This delay is a matter of great personal regret for me,” May said in her statement. May said she is on the “side” of the public now which wants the parliament to get on with Brexit and stop the in-fighting. She said “it is now time for MPs to decide”. “It is high time we made a decision. So far parliament has done everything possible to avoid making a choice,” she said. May said she will continue to work “night and day” to get MPs (including the DUP) to vote for her deal so the UK can leave the EU by 30 June. “I am not prepared to delay Brexit later than the 30 June,” she said. 'It is now time for MPs to decide' - @theresa_may says Brexit delay is a 'matter of personal regret' and that she is 'not prepared' to extend Article 50 any further than the 30th of June. 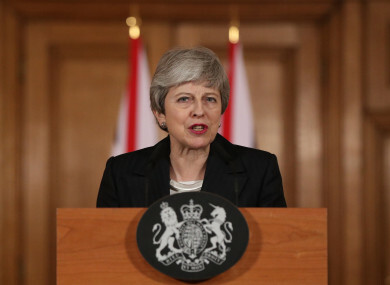 The Prime Minister also touched on the question of holding a second Brexit referendum, outlining that the UK government “asked you the question and you gave us the answer”. Now, you want us to get on with it. That is what I am determined to do. Responding to May’s earlier letter, Tusk said he believes that a short extension to Article 50 would be possible, but that it would be conditional on a positive result when the withdrawal agreement goes back to the House of Commons. “In the light of the consultations I have conducted over the past days, I believe a short extension will be possible but it will be conditional on a positive vote on the withdrawal agreement in the House of Commons,” Tusk told reporters this afternoon. His comments come ahead of a summit of EU leaders getting under way in Brussels tomorrow. Taoiseach Leo Varadkar meanwhile said it was time to cut the UK “some slack” on the extension time as there was now a real risk of a no-deal happening by accident. Speaking to reporters this afternoon, Varadkar addressed the issue of the extension, stating that the Irish government has always been open to an extension, “if there is a purpose to it”. “I don’t have a definitive view on how long an extension would be… [but we] would prefer to see this resolved sooner rather than later,” he added. He told the media that it is his understanding that May is due to speak to address the British public tonight, adding that this will be an “opportunity for her to set out her plan and timeline as to how an extension would work”. Varadkar said it is important that “we hear from her”. The European Commission, meanwhile, had advised EU leaders that a shorter delay until 23 May (the date of the European elections) or a much longer one until at least the end of 2019 would be preferable. In his comments at 4pm, Tusk sounded more positive about the 30 June date saying it “has its merits” but creates “a series of questions of a legal and political nature”. He said that he wouldn’t hesitate to call an emergency EU summit next week if the meaningful vote did not pass. Taoiseach says he took call from Tusk where he asked for his view on May’s letter. Ahead of his statement, Tusk said he had just come off a phonecall with the prime minister. He was also speaking by phone to Leo Varadkar today, and in Dublin the Taoiseach told reporters at Government Buildings that the proposed length of the extension would be discussed in detail at tomorrow’s summit. Varadkar said the “only red line that I’ve ever set down is that Brexit should not lead to a return of a hard border”. The Taoiseach added that he still believes a no-deal Brexit is unlikely. “There is a risk of no-deal happening by accident and that would be a real tragedy,” said the Taoiseach. It had been expected May could hold a third vote on the twice-rejected deal this week ahead of tomorrow’s summit, but a series of events – not least an unexpected intervention by the speaker of the House of Commons – scuppered that plan. Email “'It is now time for MPs to decide': May says Brexit delay is 'matter of great personal regret'”. Feedback on “'It is now time for MPs to decide': May says Brexit delay is 'matter of great personal regret'”.